Sometimes, we get so wrapped up in the technology and all of its fuzzy coolness of opportunities available to us with apps and websites and more that we forget that it is not about the technology at all … it’s about the connections that technology facilitates. And then I get reminded by an event or project, and I am always deeply appreciative of the opportunity to take a step back and notice what is really happening beneath the surface of connections. 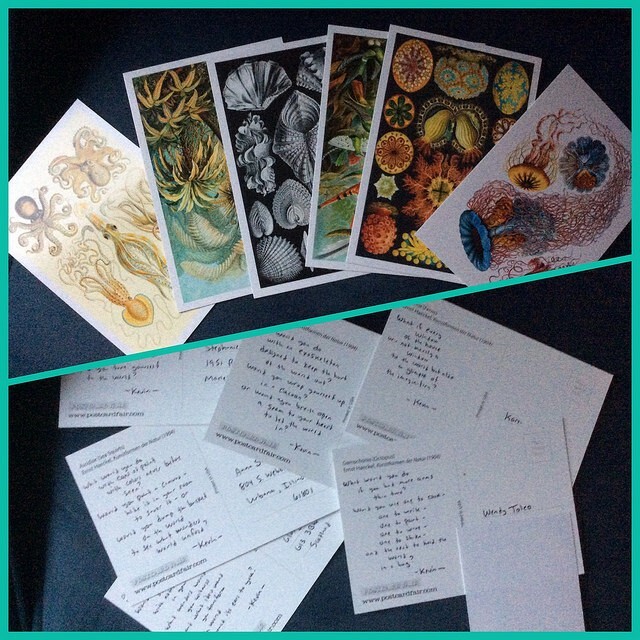 Recently, a small group of folks from the summer’s Making Learning Connected MOOC (long since “ended”) signed on for a “postcard project.” Karen Fasimpauer has led the way after getting inspired by, and sharing out, a post about mailing out postcards in the digital age. Someone suggested CLMOOCers could do that, too, and before you know it, a Google Doc was set up and folks were signing up to become senders and recipients of postcards. Karen calls it “the happy series” and well, how could you not smile when reading about that idea? My first postcard was a bright one from Karen, and (admission) I had already sort of forgotten about the postcard project when her lovely gift arrived in my mailbox. It was burst of sun in a hectic week. 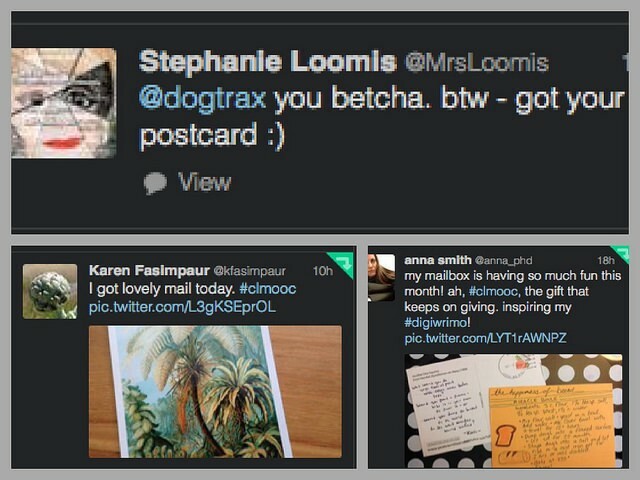 I was immediately reconnected with her, and with the postcard group, and with CLMOOC again. I took a breath in a moment of pause. The collapsing circle of everyday life sort of expanded out. Seeing her handwriting made the note more personal, and inviting. Her words made me happy. Karen’s postcard to me also reminded me to get my act together and find some postcards, which I did, and as I was writing them out, I wondered about what to say. I ended up using the imagery on the postcard as inspiration for “question poems” that became the text of the postcards. I had a special thrill as I went to the post office, asking how to send postcards overseas. My poems were then in literal flight, and my connections to other educators were strengthened by a few words on a sheet of cardboard with a picture on it. I may likely forget about the project again until another postcard arrives in the mail and then, I am sure those connections will surge back. The technology facilitated the connections, to be frank, but it has been the connections themselves that have outweighed the technology. The handwritten postcards are a reminder of the humanity behind the tweets, the blog posts, the videos and vines, and all of the flashy hoopla. It’s about us. It’s always been about us (and that includes you). Originally published at dogtrax.edublogs.org on October 18, 2015.